2013 Swaygo 575 EVR-1. Picture credits - Swaygo. Submit more pictures. The Swaygo�s leaning system allows you tilt the vehicle as required. You are in control. This dynamic inter-active capability helps to keep you balanced at all times; when travelling at low or high speeds in differing road situations and conditions. The fully independent suspension allows you the best possible ride; bumps and uneven surfaces are easily absorbed. Comments: 4 wheel motorcycle. Lithium-Ion Polymer battery, 70V 100 Ah. Range 140 km. 220 V / 50 Hz charging. Sold in South Africa. Ask questions Join the 13 Swaygo 575 EVR-1 discussion group or the general Swaygo discussion group. Rate motorcycles you know and help your fellow riders to find the bike that is right for them. Bikez has the most users and the most extensive motorcycle rating on the net. It includes reliability, design, engine performance, accident risk, repair cost, offroad capabilities, racing track capabilities and touring capabilities. The ratings are also used to rank the 100 most popular MC models each year since 1990. The lists	are adjusted weekly as new ratings are added. 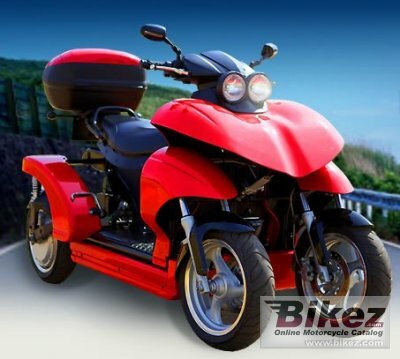 You can check out the rating of the 2013 Swaygo 575 EVR-1 and compare it to other bikes here.